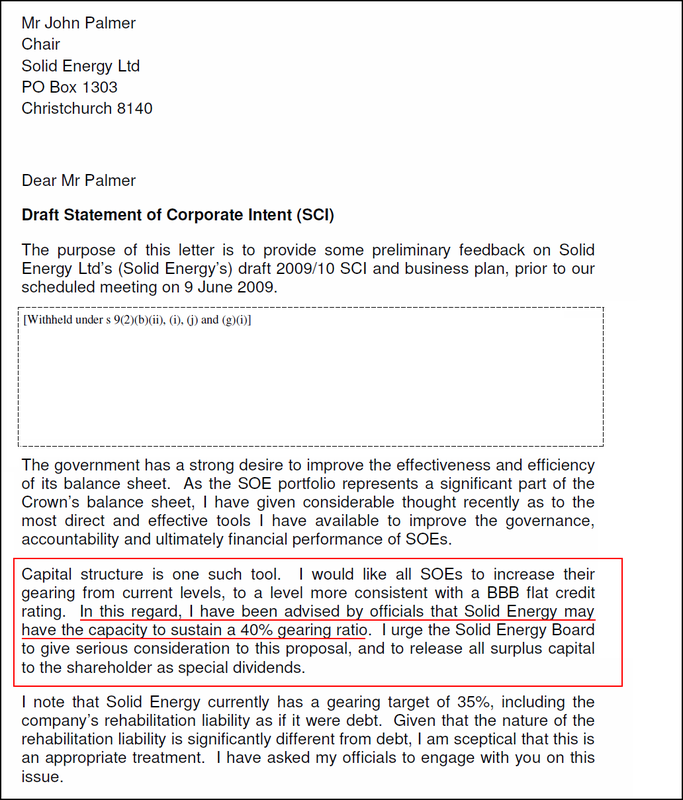 (v) And from all that, the Prime Minister suggested that “ it is pretty self explanatory that when you come to the Government with such a very large proposal ” that Solid Energy expected finance from the Crown? He told TV3′s Firstline: “I am personally yet to be convinced that we are going to uncover anything new or different that wouldn’t be uncovered” anyway. 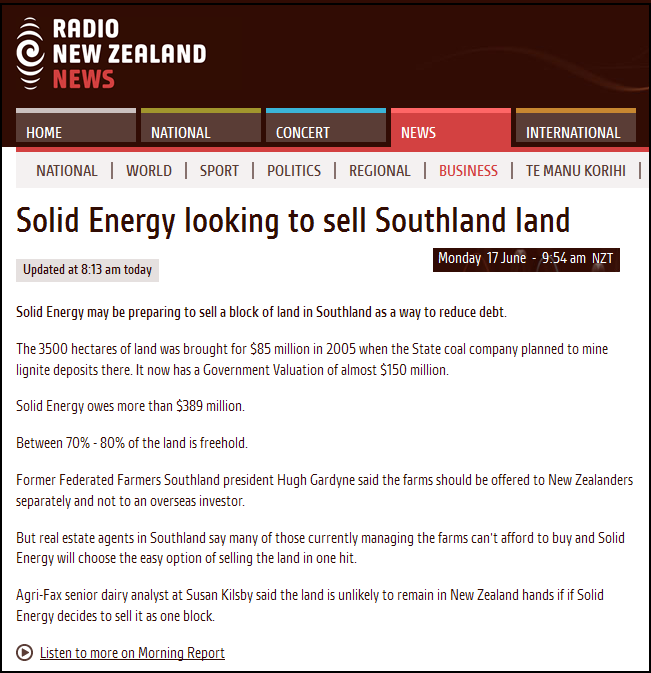 That statement – ”Look, in retrospect, they would have been better off with lower levels of debt“ – totally destroys the argument put forward by Key, English, and Ryall that Solid Energy’s debt and subsequent crisis was of it’s own making. 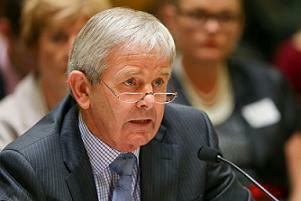 ”…dividend payments to the government have been funded by increasing debt“. 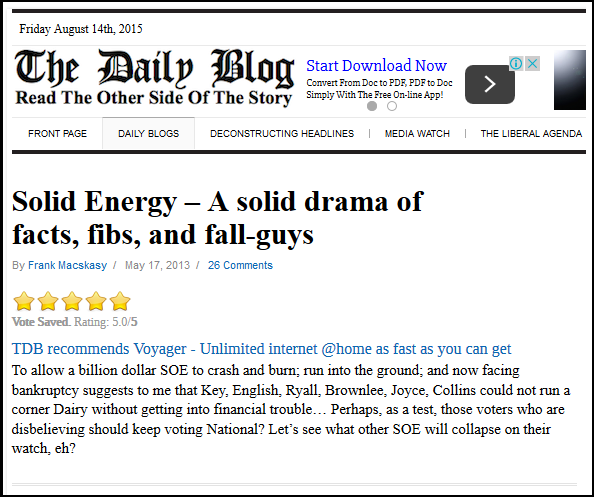 This blogpost was first published on The Daily Blog on 17 May 2013. “As President of Greypower, I wish to inform you that Greypower has been opposed to the sale of state owned assets for a number of years. And this was reconfirmed at our annual general meeting two years ago. We advised all the political parties in this House that we were opposed to them selling any of our assets. Our generation worked hard. 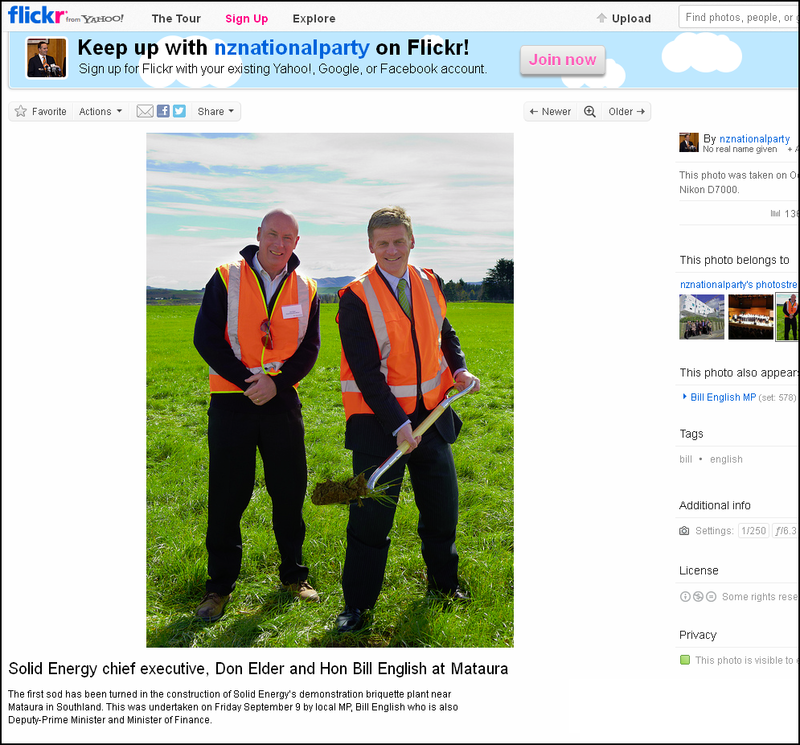 We paid the taxes, to build our existing assets. They’re not for sale. They belong to all New Zealanders. 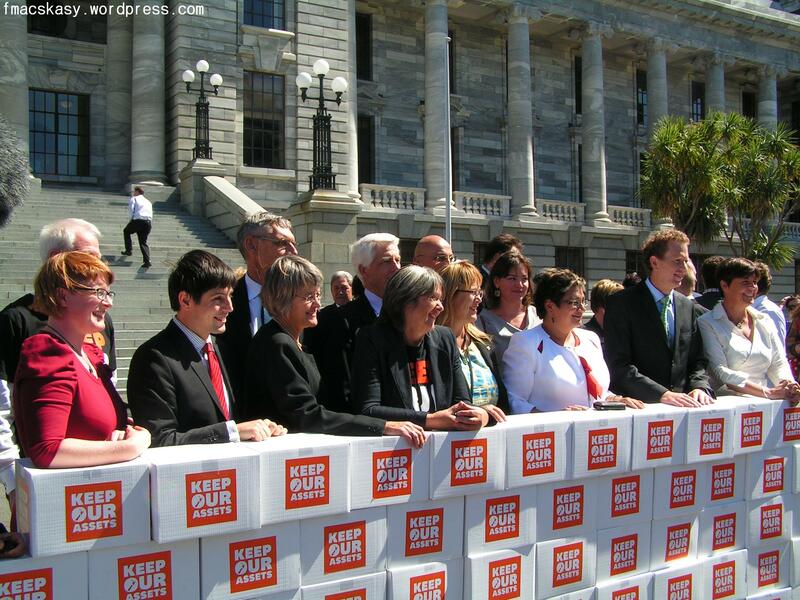 I sincerely thank all those who worked from one end of New Zealand to the other, to collect those 394,000 signatures just behind us. It’s the biggest petition ever presented to this House. 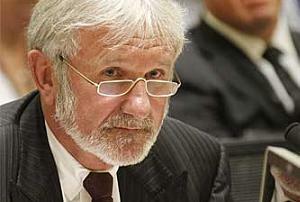 It as perhaps fitting that Mr Reid was given first opportunity to address the crowd. 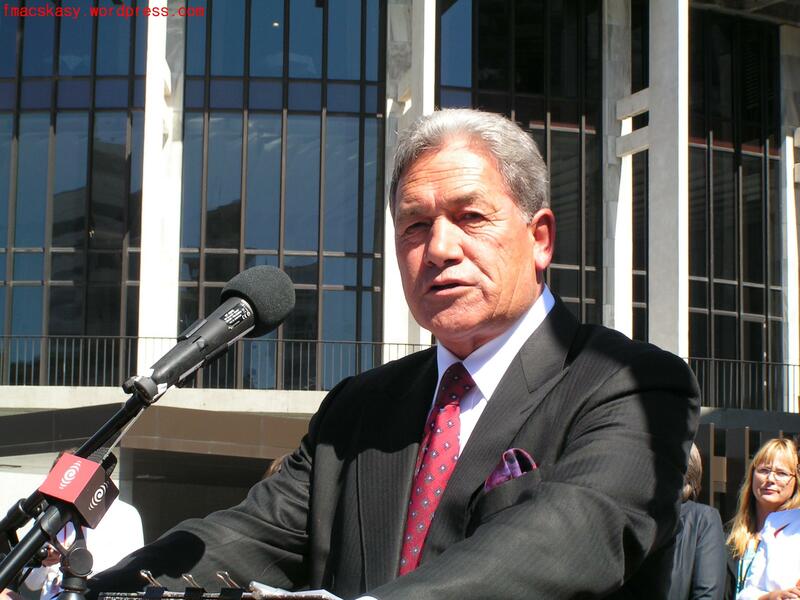 It was indeed his generation, and others before him, who sacrificed so much to build what we have in New Zealand today. 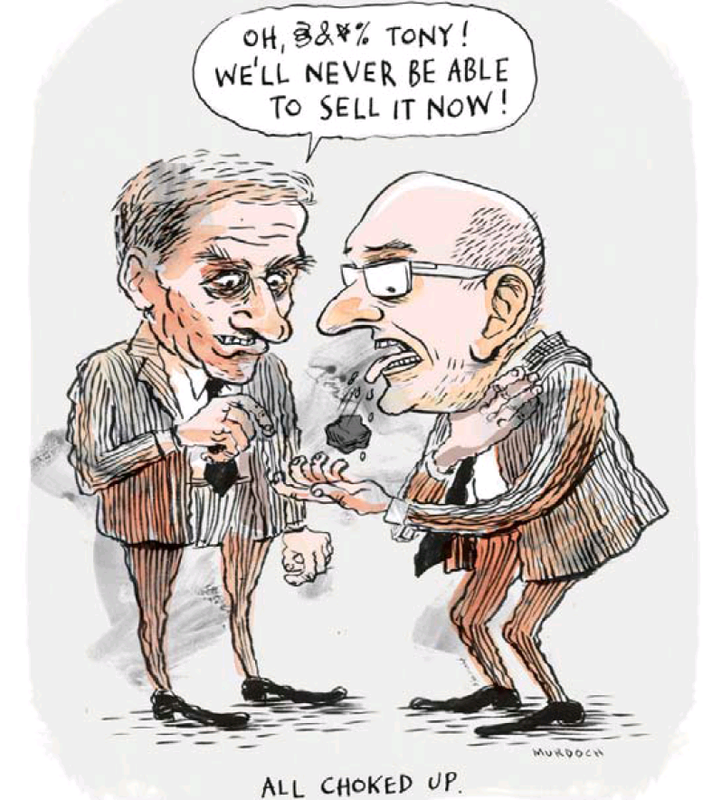 And which a few greedy, short-sighted number of our fellow New Zealanders seem unable to comprehend that these assets do, indeed, belong to us all. 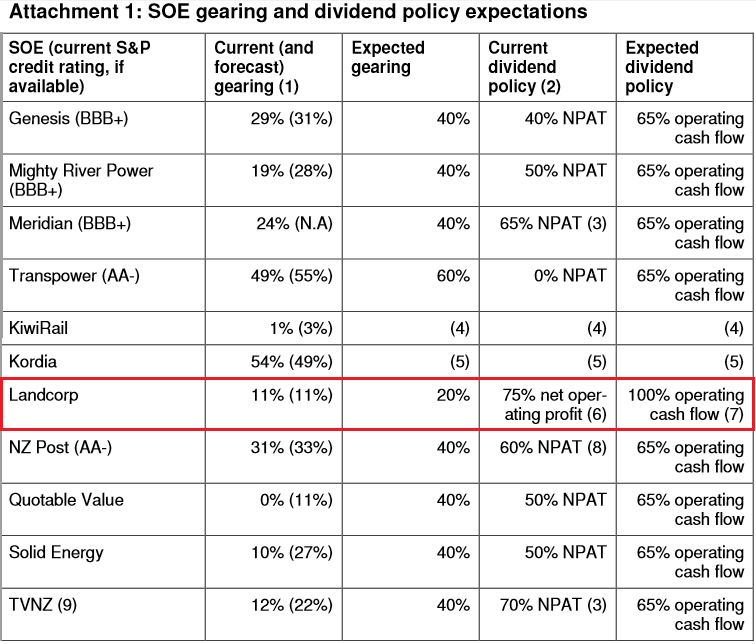 Not just to those with the cash to buy shares. “The Union movement is really proud to be here today at this amazing event and I just want to say, fantastic effort. Well done everybody! It’s awesome. … So this is part of our democracy. And what we’re saying to the government; respect democracy… Let’s get this referendum up, and the Council of Trade Unions, on behalf of the union movement, is calling on the government to halt all asset sales and listen to the people. “Look, I just wanted to start by saying ‘thank you’, ‘thank you’ for all of those people who went out day after day, weekend after weekend, who stood on cold corners in the middle of winter and got people to sign this petition. Thank you to the hundreds of thousands of New Zealanders who care about this country so much that they put their signature to this petition. This is about the transfer of an asset that we all own into the hands of a very few. That’s what it’s about, it’s about fairness. It [asset sales] is not fair. 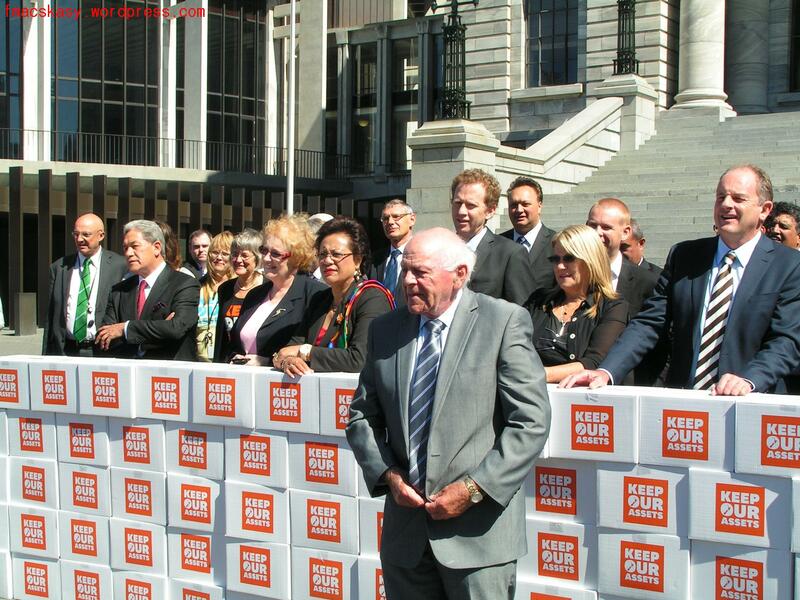 This referendum will make the government listen to New Zealanders. The fight will go on. It’s not finishing today. 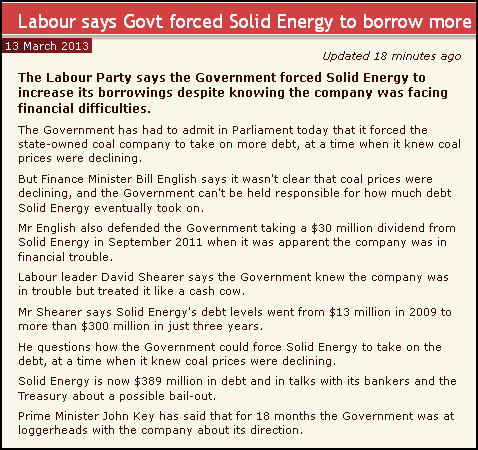 It will go on and we in the Labour Party will continue to fight this until 2014. Before Ms Maniapoto Jackson introduced the next speaker, Green Party co-leader Russell Norman, she briefly pointed out that the Parties behind her were unified, “with only the odd absence, which was duly noted“. 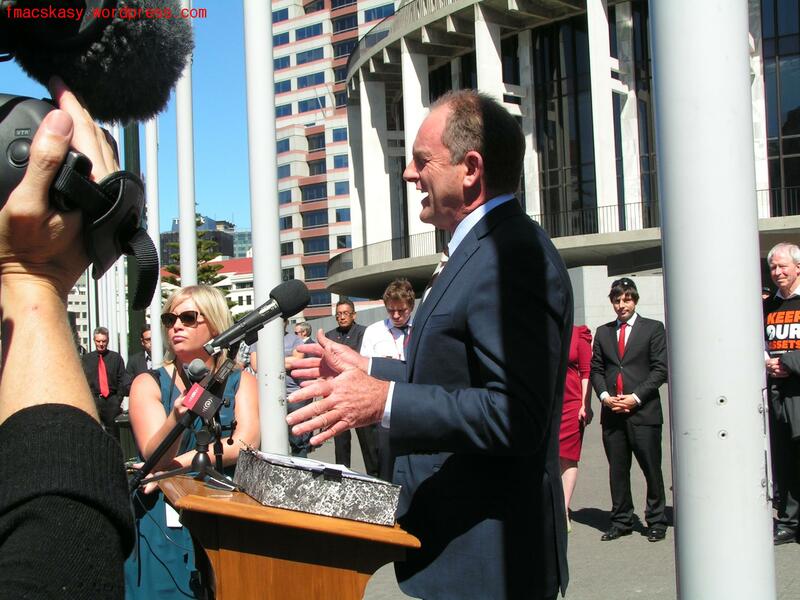 “Today we stand here here on behalf of the millions of New Zealanders who are opposed to the sale of their assets. 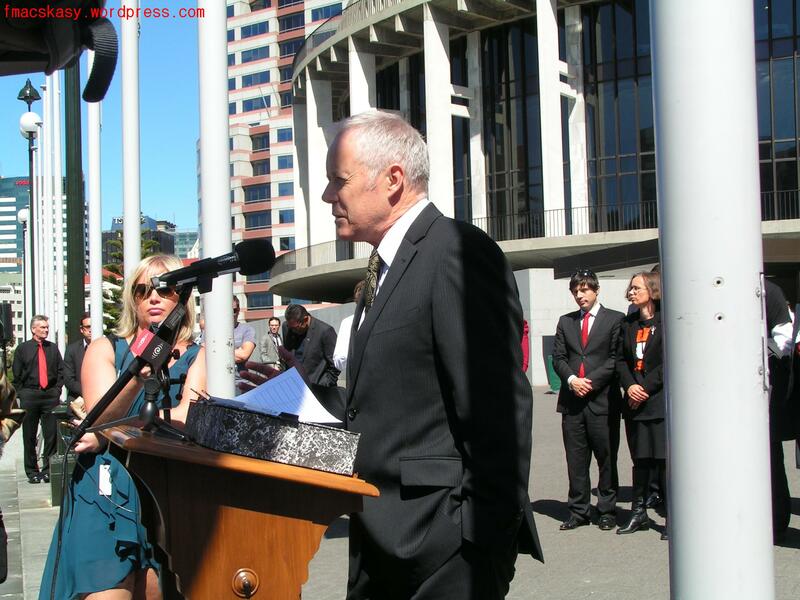 Today we stand here on behalf of the hundreds of thousands von New Zealanders who have signed this petition, behind us. Today we stand here on behalf of future generations who are relying on us to stand up for our country. And that is why we have done this massive piece of work that you see behind us. 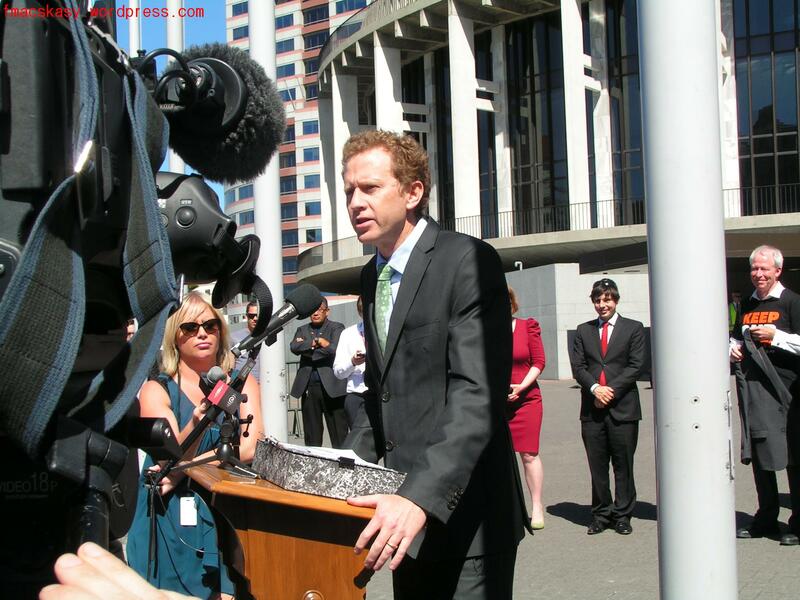 It has been incredibly hard work on behalf of thousands and thousands of people to go out and collect these signatures. It is despicable that the Prime Minister then says that the people who signed this petition were children and tourists! 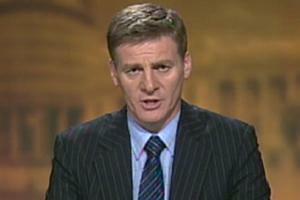 Prime Minister you do not know New Zealanders! 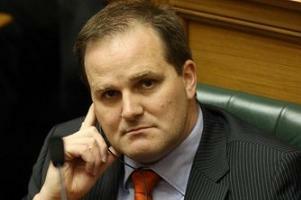 “…Mr Key does does not have a mandate to make these sales. 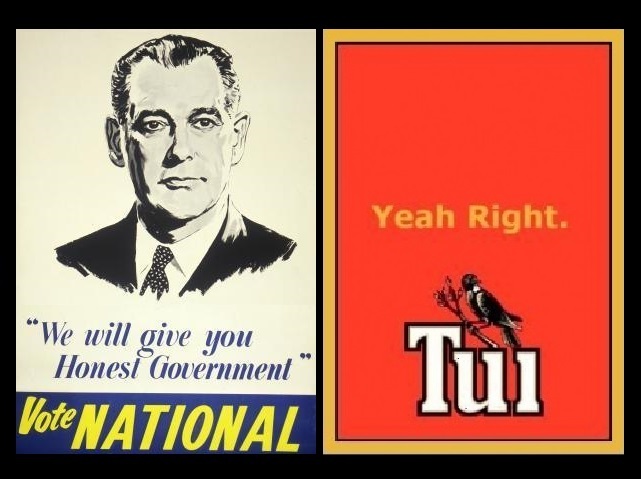 We all know the last election result and he relies upon the vote of Peter Dunne, who you know, with your money, at the last election had TV adverts saying that he would not do that. So there is no mandate. 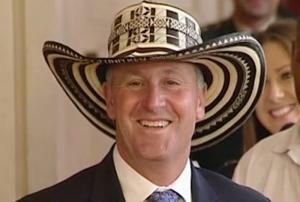 We come now to the referendum, which is a chance for Mr Key to see whether he’s got the public backing and he doesn’t have even have the backing of one third of the National Party vote by every survey that you and I have seen. Ladies and gentlemen, it’s going to be difficult over the next few months on this issue, but I want to make something very, very, clear. Unless we make it clear to everyone who’s buying, that after the next election, whenever they fly the white flag, we intend to take back those shares at no greater price than they bought it for, then we will not be making the message very clear for Mr Key who governs for the few and very few. Now your problem is, you don’t own a casino. Otherwise he’d be listening to you. And you’re you’re not a Hobbit or some wide-boy from Hollywood, otherwise, he’d be listening to you. 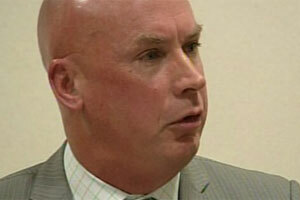 The crowd obliged with enthusiasm, clapping and cheering each time he paused during his korero. “Now just for a short chant, a short chant, eh? Because Moana get’s all the the recording rights for this little gig, so mine is going to be a short little chant. So just follow after me. You ready? 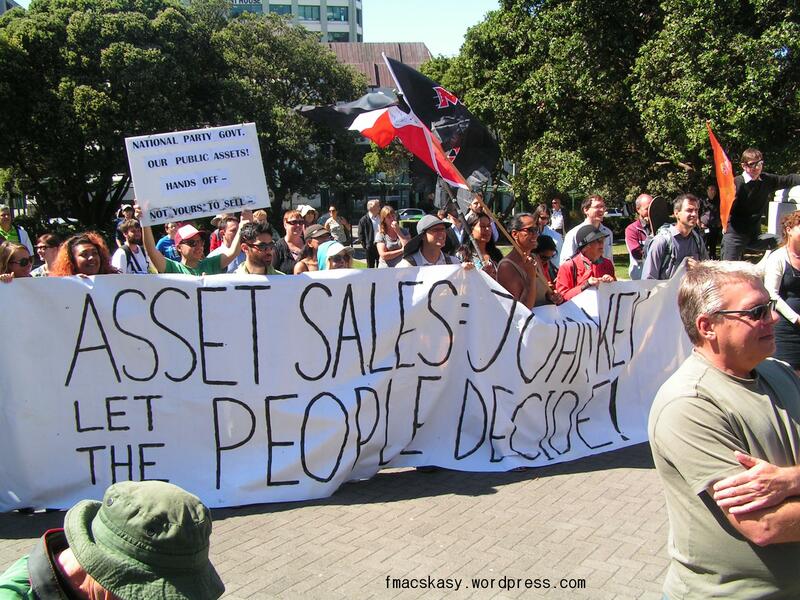 The crowd responded, “Aotearoa is not for sale“. 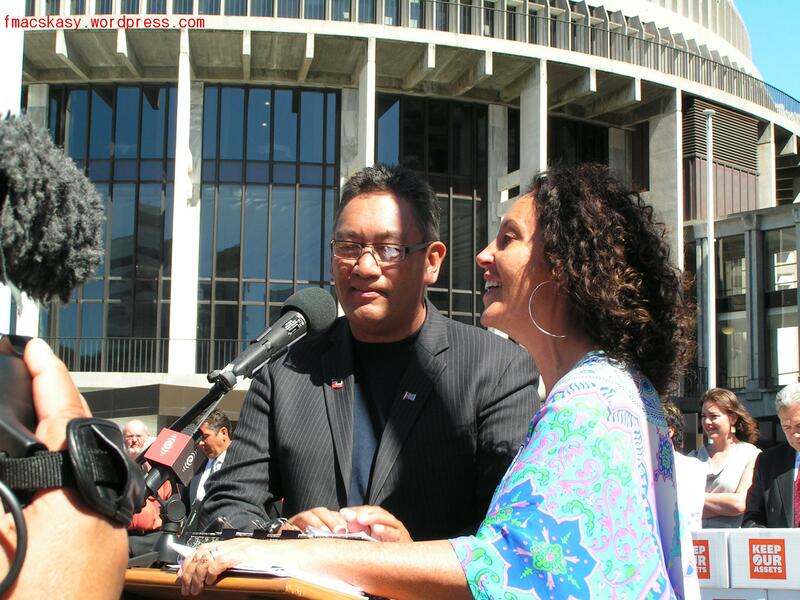 And with that, Hone Harawira finished with a cheerful “Kia ora tatou!”. As far as political speeches went, it was one of the shortest and more entertaining that this blogger has heard for a while. 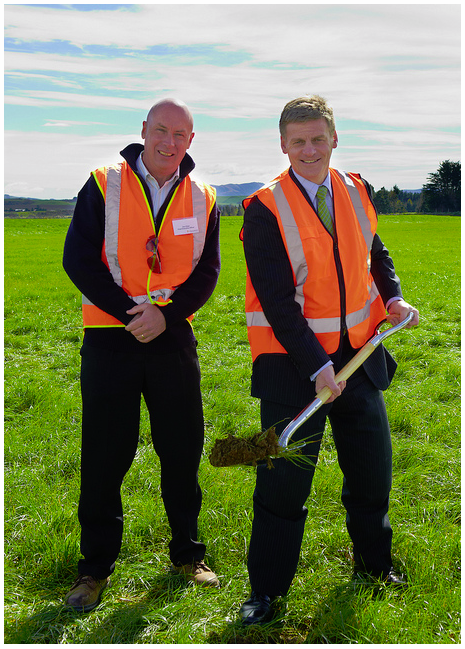 He certainly injects a bit of fun into a political event. As an intriguing aside, this blogger managed to capture this picture of two Davids and a Damian. 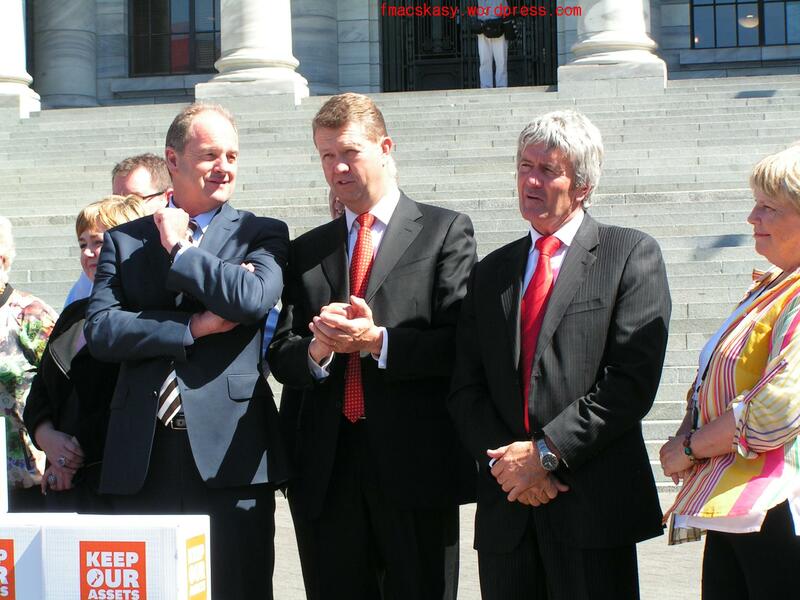 Their body language seemed to belie any suggestion of tension or ‘struggle between Messrs Cunliffe and Shearer. 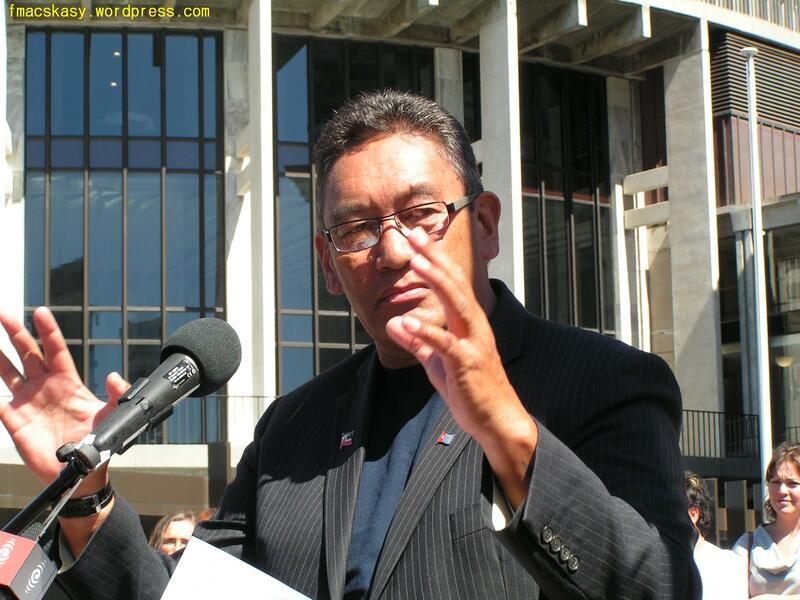 It’s interesting to compare the persona of Hone Harawira in the media, especially in his early days in Parliament – with the man who presents to the people, at public gatherings. There is a warmth and sincerity to the man that is almost wholly lacking in his MSM appearances – but a warmth and humour that is obvious when seeing him in person. 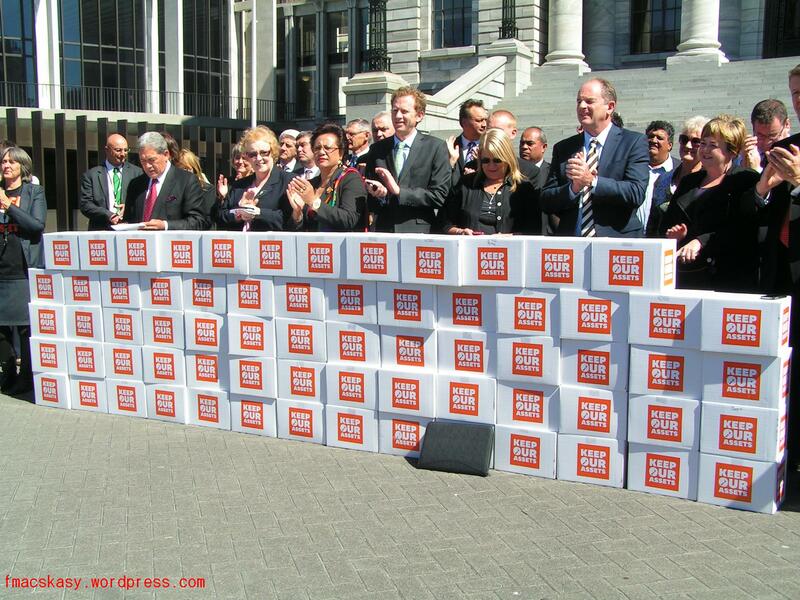 John Key’s casual dismissal of the petition, and the nearly 400,000 New Zealanders who signed it, was not a “good look”. It spoke volumes of Key’s persona; his arrogance; and his pettiness. 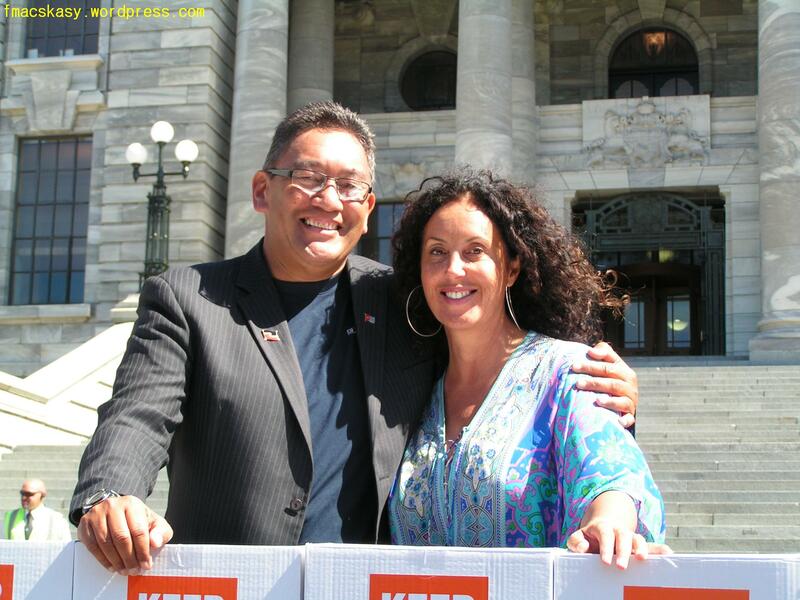 He could just as easily have accepted the petition as part of the democratic process and congratulated New Zealanders for participating. It would have made him look statesmanlike; stand above petty politics; and increased his mana. Being derisive; suggesting that the signatures were from “children and tourists”; was offensive. 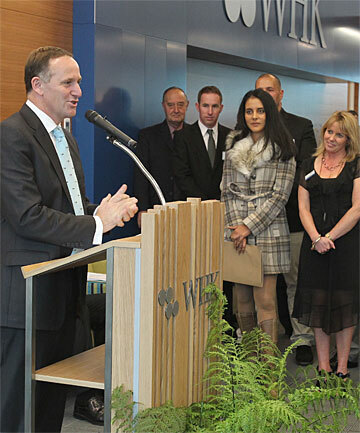 It publicly revealed John Key’s innermost insecurities – as he knows that the people are not with him on this issue. 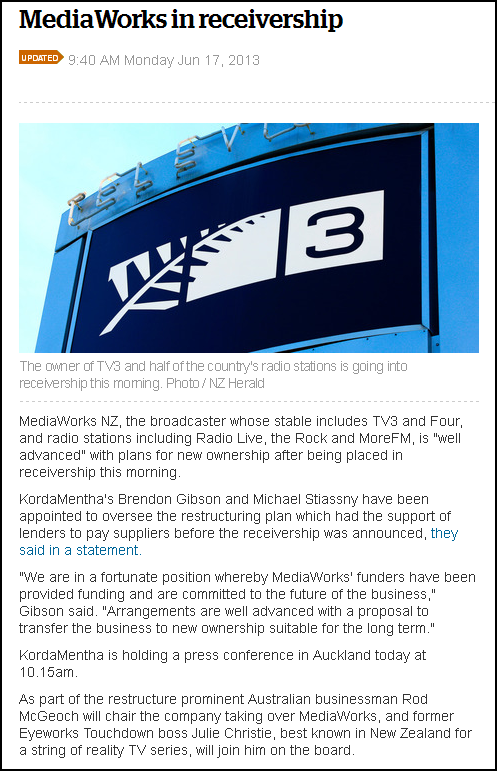 It must be a debilitating, depressing feeling, knowing that three million New Zealanders are angrily opposed to what Key and his cronies are up to. “Where is the love”, he may well ask? “Where is the respect”, we ask him. 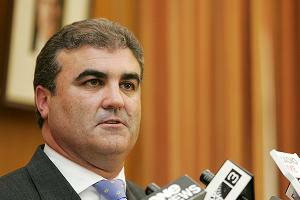 The Prime Minister insists he has a “mandate” to part-privatise our state assets. I disagree. More people voted for Parties opposing state asset sales than voted for Parties endorsing said sales. That’s not a mandate, Mr Prime Minister – that’s an accident of circumstances. 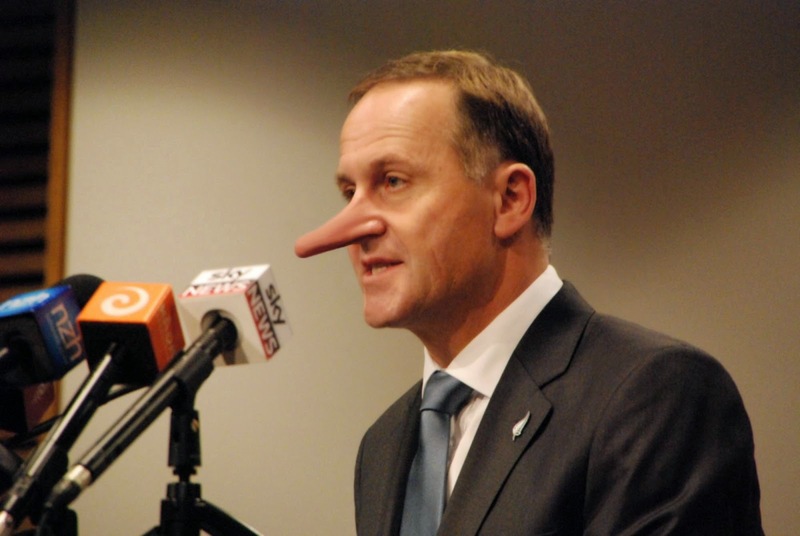 Mr Key – if you truly insist that you have a mandate, then put it to the test. 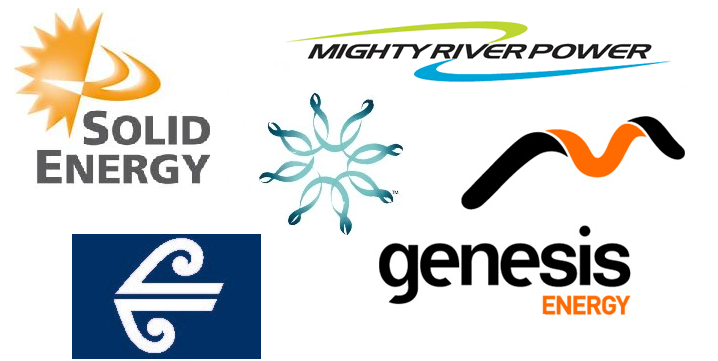 Hold off on the sharefloat for Mighty River Power. Let the people have their say in a referendum. 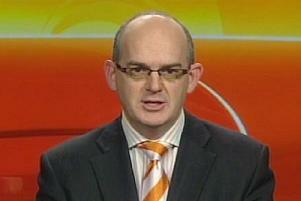 I, for one, will accept the verdict of a referendum, whatever the outcome. 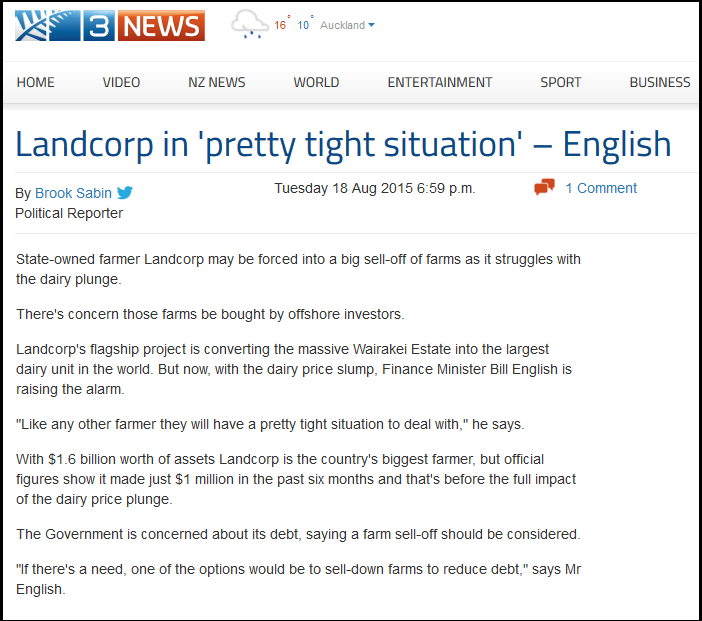 If the majority – even the slimmest margin over 50% – support your asset sale programme, you’ll not hear one more word from me on this issue ever again. 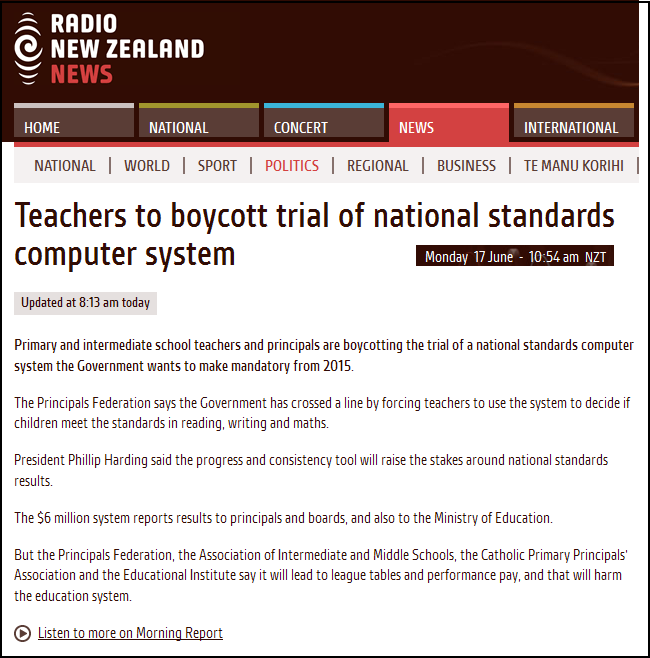 Are you willing to put your “mandate” to the test, Mr Prime Minister? Are you willing to listen to, and abide by, the will of the People?